FERGUS, Ontario – On November 20, Centre Wellington District High School celebrated the grand opening of the school’s new SHSM Media Lab. 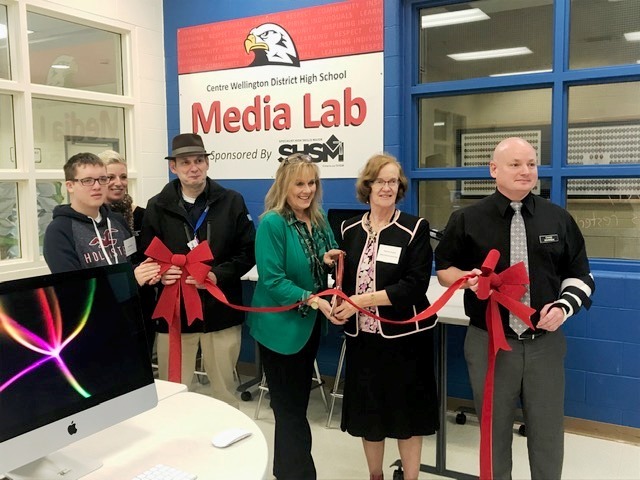 The school hosted an event to celebrate the completion of the media lab and as a way to thank the Specialist High Skills Major (SHSM) program sponsors who funded the initiative. The SHSM Media Lab was designed to be a space for students and staff to make creative content in an innovative space. The lab has hardware and software as well as audio, digital and other equipment needed for production. The goal of the lab is to nurture and enhance the integration between innovative ideas and media technologies. The media lab encourages collaboration between students and allows them to engage with new teaching strategies. The grand opening showcased student work and gave those in attendance the chance to hear from students and teachers about what the workspace means to them. CWDHS staff are excited to be a part of a great initiative that sees them learning alongside their students.